She Writes Press, 9781938314926, 184pp. 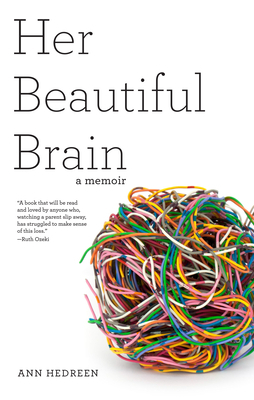 Her Beautiful Brain is Ann Hedreen's story of what it was like to become a mom just as her beautiful, brainy mother began to lose her mind to an unforgiving disease. Arlene was a copper miner's daughter who was divorced twice, widowed once, raised six kids singlehandedly, survived the turbulent '60s, and got her B.A. and M.A. at 40 so she could support her family as a Seattle schoolteacher--only to start showing signs of Alzheimer's disease in her late fifties, taking Ann and her siblings on a long descent they never could have anticipated or imagined. For two decades--as Ann married, had a daughter and a son, navigated career changes and marital crises and built a life making documentary films with her husband--she watched her once-invincible mom disappear. From Seattle to Haiti to the mine-gouged Finntown neighborhood in Butte, Montana where she was born and grew up; from Arlene's favorite tennis club to a locked geropsychiatric ward, Her Beautiful Brain tells the heartbreaking story of a daughter's love for a mother who is lost in the wilderness of an unpredictable and harrowing illness.